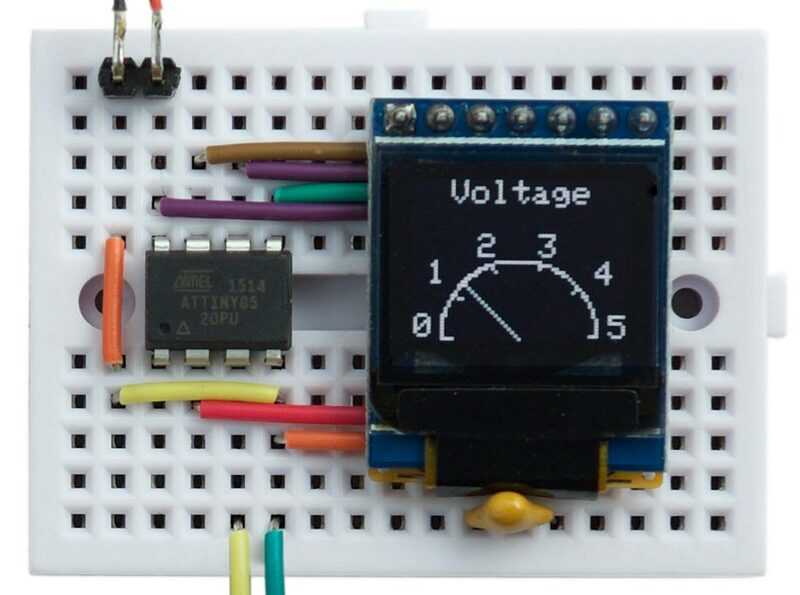 Analogue voltmeter using a 64x48 OLED graphics display based on an ATtiny85. It should be relatively straightforward to redesign the code to work with any other AVR processor. Update: For an extension to this program that adds the ability to plot double-size characters see Big Text for Little Display. I recently wanted a flexible way of displaying information from a project, and found this small monochrome 64x48 OLED display on Aliexpress . A similar one is available from Sparkfun . Although both SPI and I2C versions are available, I chose the SPI version because the display update is faster. The display needs 4 pins to drive it, just within the capabilities of the ATtiny85 and leaving one pin available for another application. You can't read the display memory, so to do graphics you need to write into a buffer in RAM, and then copy this to the display. Because the display is 64x48 pixels it requires 68x48/8 or 384 bytes of memory for the graphics buffer, again just within the capabilities of the ATtiny85. Circuit of the 64x48 OLED graphics display based on an ATtiny85. The resistor from the display's CS pin holds the chip select high to prevent the display from being affected by the ISP signals while programming the ATtiny85. The display uses the SSD1306 driver chip  which divides up the display into columns one pixel wide, and horizontal bands eight pixels high which are referred to as pages. The DisplayBuffer() routine display the contents of the buffer by copying the bytes to the display. For this application we're using the display's Horizontal Addressing mode, which copies bytes to the display memory from left to right and top to bottom. To use this mode you just specify the column and page ranges with the commands 0x21 and 0x22, and then send the 384 bytes. I spent a bit of time optimising the Data() routine, to make the display update as fast as possible. This version uses a variable changes to determine whether the data pin, PB1, should be changed for each bit to be output. This allows us to write to the PINB port to toggle the bit. With an 8 MHz ATtiny85 this routine updates the display in about 5.4 msec. This implies that we can update the display about 180 times a second, fast enough for simple animations. Note that this doesn't do any checking, so either make sure you don't plot points outside the display area, or add a line to check the x and y values. The first row defines the bit pattern for ASCII character 32, space, and so on up to character 127. The second application reads the analogue signal on the analogue input A2 (PB4) and displays it as a waveform on the display. Simple oscilloscope displaying a triangle wave, using the ATtiny85-based graphics display. Animated wireframe cube using the ATtiny85-based graphics display. Here's the whole ATtiny85 Graphics Display program with the examples: ATtiny85 Graphics Display Program. 8th May 2018: Changed the declaration of the character map from uint32_t to uint8_t. Thanks to Larry Bank for pointing this out. 3rd December 2018: Fixed the circuit diagram so the CS pin is held high by the 33kΩ resistor (not low), and tidied up the program to make it consistent with Big Text for Little Display. ^ Geekcreit XR2206 Function Signal Generator DIY Kit on Banggood.